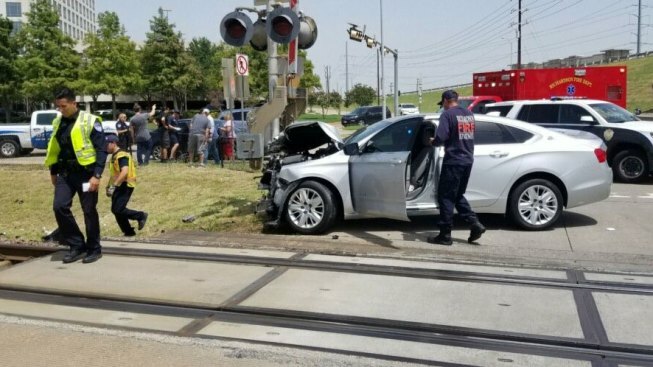 Richardson police and fire respond after a driver crashed into a DART train south of the Arapaho Station, Tuesday, July 17, 2018. DART says Red Line and Orange Line trains are delayed by 15 minutes or so after a car crashed into a train not far from the Arapaho Station. The crash took place at about 2:30 p.m. as a northbound Red Line train passed the Collins crossing south of the station. DART said the vehicle has been pushed to the side and is not blocking the tracks. "Red Line & Orange Line trains continue to be single tracked on the southbound side at both Arapaho Center and Galatyn Park stations as police investigate," DART said in a statement. "Current delay is 15 minutes." It is not clear what led to the crash. Richardson police are investigating.